be sure to go bunting mad! Ah, bless… Royal Wedding fever has knocked us for thoughts and pennies, naturally in honour of the festivities to be held on 29th April for Prince William of Wales and Catherine (kate) Middleton. So then, how green will this wedding actually be? 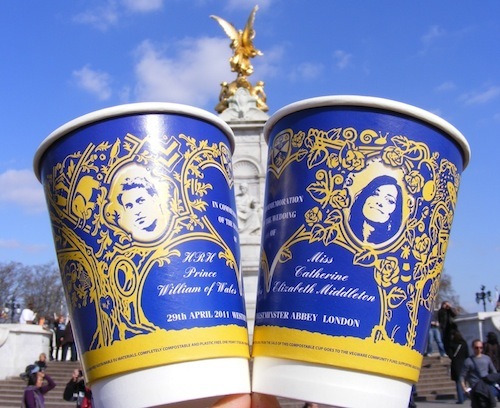 Vegware (Edinburgh based), the eco packaging pioneers who won a Climate Week Award, have launched the greenest Royal Wedding cup on the market. Made in the British Isles from sustainable materials, the commemorative coffee cup can be commercially composted together with food waste. A penny from the sale of each cup goes to the Vegware Community Fund, which supports grassroots sustainability groups all around the UK. That’s just the beginning… like many Royal bridesware before, the designer of the dress is almost certainly British and will be made in the UK, which will definitely keep those travel miles down! Prince William will follow tradition and wear military uniform on the day, and it’s likely he will wear his current RAF uniform on the 29th, created by Gieves & Hawkes a tailors in Savile Row, London. So not only will his outfit be made in the UK, but he will also have the option to wear it again. There’s speculation too that fair trade white roses from Kenya (which is where William proposed to Kate) will be included, and by holding the celebrations at Buckingham Palace they are keeping costs down and using resources already available to them. To top the Royal delights off, the couple have even set up a charitable gift fund for those who may wish to donate to charity instead of buying the couple a gift. This is a great idea and a lot of charities are most certainly going to benefit from the wedding! And finally, it has been reported that the couple are looking at taking their honeymoon in the UK, maybe at the Isles of Scilly. So what more could we ask for in a British Royal wedding? A day public holiday to enjoy it all? You got it! Have a lovely day, and be sure to go bunting mad!